Would building the Jefferson Parkway along the contaminated eastern or Indiana St. edge of the Rocky Flats National Wildlife Refuge endanger public health by stirring up clouds of plutonium-laden dust? The Superfund “cleanup” completed in 2005 at the site of the defunct Rocky Flats nuclear bomb plant left unknown quantities of plutonium particles in the soil. The alpha radiation emitted by plutonium can be harmful only if plutonium is taken into the body. Inhaling minute particles is thus the worst way of being exposed to this highly toxic material. Particles lodged in the body continually irradiate surrounding tissue for as long as the particle remains, which could be the rest of one’s life. The result years later may be cancer, genetic harm or disruption of the immune system. Hence the pertinence of the question whether building the proposed highway at Rocky Flats would endanger people by exposing them to plutonium. To answer this question, the Rocky Mountain Peace and Justice Center contracted with Marco Kaltofen of the Boston Chemical Data Corp. to collect soil samples in the area proposed for construction of the highway and to analyze the samples for plutonium content. We asked the U.S. Fish & Wildlife Service, the agency that manages the wildlife refuge, to allow Kaltofen and his colleague, Strongbear, to enter the refuge to collect samples in the area intended for the highway. FWS denied this request. Thus, in September 2011 when Kaltofen and Strongbear came to Colorado they collected samples outside the refuge fence along Indiana St., route of the proposed highway. In this area they collected 19 samples from surface soil, plus 3 at a depth of 12 inches and 1 at a depth of 6 inches. Samples in which they detected plutonium were further analyzed for composition and the size of individual microscopic particles to identify those that represent a significant inhalation hazard. Figure 1: Plutonium distribution in soil in 1970; adaptation of a map prepared in that year by P. W. Krey and E. P. Hardy of the Atomic Energy Commission. The Rocky Flats site is clearly identified on this map. The dotted red line indicates the route proposed for the Jefferson Parkway. Click to enlarge. Plutonium: The Indiana St. samples showed the presence of both plutonium-239/240 and plutonium-238 (see Figure 2). Plutonium-238 is far more radioactive than 239 because its half-life is only 87.7 years, while that of 239 is 24,110 years. Uranium and thorium: Soil samples taken along Indiana St. as well as from more remote locations showed elevated levels of naturally occurring uranium and thorium. Though these materials are not part of the contamination from Rocky Flats, Kaltofen points out that they do represent an inhalation hazard because they contain alpha emitting particles that are in the size range of respirable particles (0.5 to 5.0 microns). This means there is more alpha radiation in the area proposed for the highway than simply that emitted by plutonium. Hot particles: Particles that contain substantially more radioactivity than surrounding inert material and that are in the size range that can be inhaled and entrapped in air sacs of a lung are referred to as hot particles. Plutonium-bearing samples in this study contained multiple hot particles. Many of the particles catalogued in this study were in the size range that is easily inhaled and retained in the lungs. Official standards for permissible exposure are not calculated in a way that takes account of the concentrated danger posed by hot particles. Figure 2. 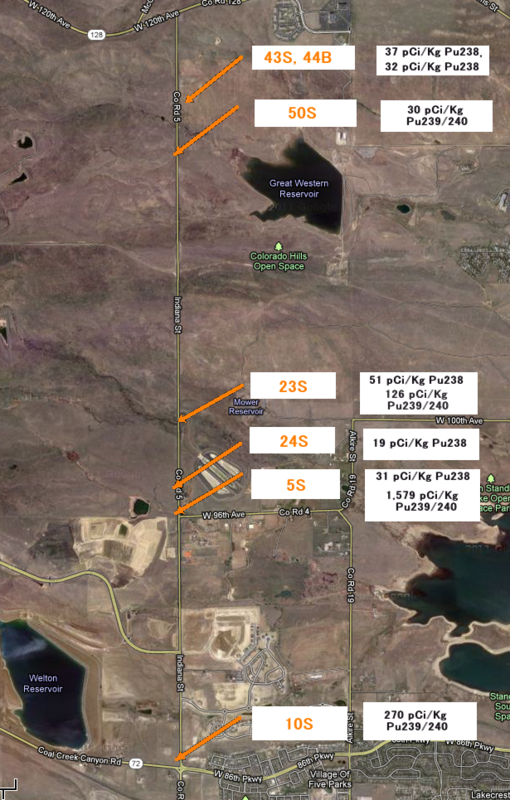 Location of samples collected along Indiana St. that contained either plutonium 239/240 or plutonium-238 or both. Each sample is indicated by a number assigned to it followed by its plutonium content in picocuries per kilogram (pCi/Kg). To translate into picocuries per gram (pCi/g), multiply by 1,000. Thus the 30 pCi/Kg content of sample 50S = 0.030 pCi/g, the 1,579 pCi/Kg content of sample 5S = 1.579 pCi/g. All samples are soil samples except for 44B, which shows plutonium found in tree bark at that location. Plutonium is not part of natural background radiation, but due to fallout from atmospheric detonations background radiation around the world now includes some quantity of plutonium. Specifying the average background for plutonium in soil along the Front Range of the Rockies in Colorado means that deposits in excess of this amount can be attributed to Rocky Flats. 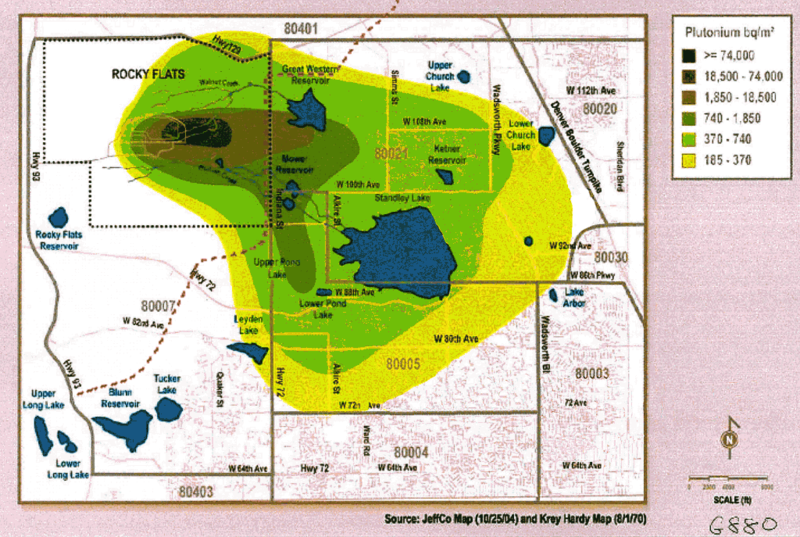 The “cleanup” of the Rocky Flats site was predicated on an average background level for plutonium of 0.04 picocuries per gram of soil (pCi/g). By contrast, according to Kaltofen’s calculation, the average background level measured by Krey and Hardy in 1970 is 0.010 pCi/g. In addition, in 1994 Scott B. Webb and colleagues at CSU in a study on “The Spatial Distribution of Plutonium in Soil Near the Rocky Flats Plant” found a median level of 0.011 pCi/g in samples collected along the Front Range more than 10 miles from Rocky Flats. Finally, an August 2002 Los Alamos National Laboratory study found between 0.010 and 0.023 pCi/g of plutonium-239 in soils and sediments of the upper Rio Grande valley of southern Colorado (LA-13974-PR). Collectively, these studies suggest that the Rocky Flats “cleanup” may have been done in a way that underestimated the amount of plutonium deposited in the environment from the Rocky Flats Plant itself. The quantities, ranging from 0.01 pCi/g to 0.04 pCi/g, are very small, but when dealing with plutonium very small amounts matter. If Krey and Hardy’s background number is more accurate, the “cleanup” may have been less protective than it should have been. A recommendation: In response to the foregoing, the EPA and CDPHE should perform a comprehensive analysis of undisturbed soils along the Front Range in areas least likely to have been affected by Rocky Flats to arrive at a definitive calculation of average background for plutonium from global fallout in the area. This number would serve as a baseline for all future work related to plutonium in the environment on and off the Rocky Flats site. I am the author of this article. It contains one mistake, in the fourth line of the Figure 2 caption, I meant to say “divide by 1,000” rather than “multiply by 1,000.” I thank Evan Ravitz for spotting my error.